WinTV v8.5 is the latest version of the WinTV v8 application for Windows. This download is a complete WinTV v8.5 installation package, including drivers for supported WinTV products plus utilities. If you have a Hauppauge WinTV-HVR-850, WinTV-HVR-950 (not the WinTV-HVR-950Q), Colossus (not Colossus 2) or HD PVR model 1212, you MUST use WinTV v8. WinTV v8.5 does not support these products. A WinTV v8.5 Activation Code will be needed to install this WinTV v8.5 version. If you do not have an Activation Code , but you have a WinTV v7 CD, you can install the WinTV v8 application (look in the WinTV 8 Download tab). If you do not have either an Activation Code or your original WinTV v7 CD-ROM, you can purchase a new WinTV v8.5 Activation Code on the Hauppauge webstore for $9.95 or $11.95. This can then be used to activate WinTV v8.5 (or WinTV v8). If you have a WinTV v8 Activation Code for Extend, the latest version of WinTV v8.5 with Extend will also be installed. Note: You will need to have your WinTV v8.5 Activation Code to complete this installation. If you do not have a WinTV v8.5 Activation Code, you can either buy one on the Hauppauge webstore for $9.95, or if you have a WinTV v7 CD, you can download and install the latest version of WinTV v8. Run wintv85setup from the Download directory on your PC. Halfway through the installation, a message will pop up asking for you to enter the Activation Code. At the Activation required screen, click on Enter Activation code and enter the activation code which was emailed to you, is printed on the WinTV v8 activation card or printed on your WinTV v8 CD. You do not need to enter the dashes, and you can use upper or lower case characters. When the installation is complete, you will find the WinTV icon on your Windows desktop. Double click on this icon and the WinTV application will run. On the first run of WinTV, it will automatically go through the TV source selection and will scan for channels. The WinTV manuals can be found here. 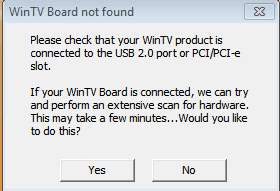 Note: If you have run HCWCLEAR, you must reboot your PC and leave the WinTV-HVR-1950 installed. After a reboot you will see the Found New Hardware Wizard installation message, hit Cancel. then continue below. Note: to use the WinTV-HVR-1950 with Microsoft's Windows Media Center application in Windows Vista or Windows 7, you only need the WinTV-HVR driver. This download is a complete installation package, including drivers for supported WinTV products plus the WinTV v7 application and utilities. If you have a WinTV v7.2 CD-ROM with Extend, then the latest version of WinTV Extend will also be installed. at the conclusion of the installation a dialog box will pop up saying "Activation required"
Fixed an error "You do not have access to make the required system configuration modifications..."
At 'Download TV options', click Next. You will then see: Cable / Satellite / Antenna. Chose the source of your TV signal (Cable for use with analog cable TV) and click Next. Click through the rest of the settings, set up your Guide listings and click Finish. Then return to the main menu. Go to TV + Movies and then live TV to watch and record TV. Download the Windows driver above. Double click the downloaded driver. This will install the WinTV-HVR-19xx Windows driver. 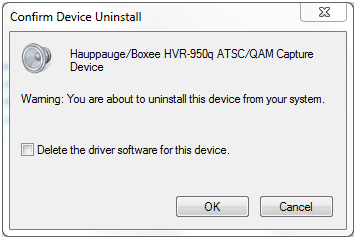 At the completion of the driver install, you should see a message which says Drivers have been updated successfully. At this point, the Windows driver will be installed. Here is a screen by screen view of the setup of Windows Media Center. It was based on the WinTV-HVR-1600, but the setup with other WinTV-HVR products will be similar. Use this utility to enable or disable the built-in IR receiver/blaster hardware on the WinTV-HVR-1850 and WinTV-HVR-2250 for use with Windows Media Center. You would disable the built-in IR receiver/blaster if you are using an external USB attached Windows Media Center remote control. To configure as a Windows Media Center remote control, put a check in the box labeled Hauppauge Consumer Infrared Receiver click OK – Save Changes. Your computer must be restarted for the changes to take effect. Microsoft has released Windows Media Center patches for the "Low bit rate" error message. Click to view the information from Microsoft. The WinTV Digital Signal Strength indicator displays information about the quality of the digital TV channel you are watching. This application is used with the WinTV v7 and WinTV v8 applications. Click here for instructions on using this application. Remote control applet. After you run this applet, an icon will appear in your Windows device tray showing that the Hauppauge remote control is active. This program configures the IR blaster for use with the WinTV v7 application. Included is the selection of the set top box and the learn mode. This TV program scheduler for WinTV version 6 allows 'background recording' on dual tuner WinTV products. New features include 30 presets and local/distance reception. Also, name radio stations by creating a preset and then clicking on the freq display and typing in the string you want. Click here to see instructions on using the new WinTV Radio32 application. Remote control applet for use with WinTV 7. After you run this applet, an icon will appear in your Windows device tray showing that the Hauppauge remote control is active. Is a free Personal Video Recorder (PVR) and Media Centre application for Microsoft Windows. SnapStream Beyond TV™ 4 : "Proving that a PC can rival TIVO" ! Supports the latest Hauppauge TV tuners. Here is a chart which shows some of the things you need to know about each type of connection. Notes You can use a roof top antenna for best reception. Most set top boxes allow you to switch to Channel 3 or 4. When you scan with WinTV, it will pick up the TV signal on the correct channel. Some satellite receivers use channels 60, 70 or 73. But when you scan for Analog TV channels, WinTV will pick up whatever channel is being used by your set top box. Most set top boxes have A/V connections on the back, which can go into the WinTV's A/V input. Some cable TV networks transmit analog TV channels, so we recommend scanning for both Clear QAM and analog TV. Not all cable TV networks transmit clear QAM. Check with your local cable TV operator for the availability of clear QAM in your area. Click on the Hauppauge device to open it. If you see the following: "Windows cannot verify the digital signature for the drivers required for this device. A recent hardware or software change might have installed a file that is signed incorrectly or damaged, or that might be malicious software from an unknown source. (Code 52)"
This appears to be a bug in Windows 64 bit OS since the Hauppauge Windows drivers are signed. The following is the easiest fix to Error Code 52 on Windows 7 or Windows 8 64bit. Take a look after a few minutes if the drivers are installed automatically properly under Sound Video and Game Controllers. This can be caused by a corrupt WinTV v7 Channel Database. You will need to uninstall and reinstall the WinTV v7 application and the Channel database to fix this. To uninstall WinTV v7, click Windows Start, click on All Programs, click on Hauppauge WinTV run Uninstall Wintv7. You can also or remove Wintv7 using control panel "add/remove programs". Windows Vista, 7 and 8: Go to C:\program data ( this folder is a hidden folder so if you do not see it you need to “show hidden folders “ in your search Options) once you can get to this folder you will see a folder label “Hauppauge”. Delete this folder. What Operating Systems are supported by the WinTV-HVR-1950? Microsoft® Windows 10, 8, 7®, Vista or Windows XP with Service Pack 2. Can I use the WinTV-HVR-1950 with Media Center? Yes, the WinTV-HVR-1950 can be used in Windows 7, Windows XP or Vista Media Center. Please note: you will only be able to configure WinTV-HVR-1950 as either a Digital tuner or an Analog tuner. You will not be able to switch between Digital and Analog channels. What type of channels will I receive with the WinTV-HVR-1950? NTSC Analog CableTV or over-the-air analog TV: You can use your cable TV from the wall to connect to the WinTV-HVR-1950 and receive all of your basic Cable TV channels. You can also use a roof top antenna to receive "over-the-air" TV. Note: After June 2009, most areas in the United States no longer broadcast over-the-air analog signals. ATSC over-the-air digital TV: Supports all ATSC formats, up to the high definition 1080i format! Note: For ATSC digital TV, a rooftop/out door antenna is recommended for optimal results/signal strength. ClearQAM cable TV Channels: Clear QAM digital cable TV channels are unencrypted digital cable TV channels. Clear QAM allows users to watch unencrypted digital TV channels from their cable TV provider without a set-top box. Can I get HD with the WinTV-HVR-1950 through my Cable or Satellite box? No. The WinTV-HVR-1950 has an ATSC over-the-air digital TV receiver built-in and supports all ATSC formats, up to the high definition 1080i format . The WinTV-HVR-1950 will support ATSC broadcasts that are currently being transmitted over-the-air. It will not be able to decode HD broadcasts that come through your cable or satellite box. The WinTV-HVR-1950 also will support clear QAM cable TV channels through your direct cable TV line if available from your cable TV provider. What type of recordings can I make with the WinTV-HVR-1950? For ATSC and Clear QAM digital TV recordings, the recording format and bit rate is exactly the same as the broadcast format (i.e. ATSC 1080i is recorded at 1080i). Note: TS files can be converted to MPEG files using options in the WinTV 7 configuration menu. Note: The WinTV 6 application recording are in MPEG format for both digital and analog. Note: Not all recordings made with ATSC/QAM signals are DVD compliant. Can I Record One Channel while watching another with the WinTV-HVR-1950? No, the HVR-1950 is a single combo-tuner, so it will only record and allow you to view one channel at a time. Digital TV, especially ATSC high definition digital TV, is very CPU intensive. Many graphics cards have special built-in hardware to speed up decoding of high definition TV channels. On graphics cards without special video decoding features, you can often improve the playback performance by using the Video Renderer settings located in the settings menu of WinTV 7. To open the setting menu click on the “gear” button located in the lower left of the WinTV 7 screen. The default mode is EVR. The other modes are VMR9, VMR7 and Overlay. Each mode uses a different process to render video. Try each mode and use the one which gives you the best results. To use hardware acceleration put a check in the box “use hardware acceleration when possible. This will allow your graphics system to use hardware acceleration for video decode. Note: graphics hardware acceleration does not work on all systems. After making a change in video rendering settings Wintv must be restarted to take effect. If you are using WinTV 6 then the render options are part of a separate program called Primary. Changes in the Primary applet must be made with the WinTV application closed. Open the Primary program by going to Start – All Programs – Hauppauge WinTV – Primary. After making changes close the Primary applet and open the WinTV application. I receive a "Low bit rate" error message when using Windows Media Center in Windows 7. What file size will the recorded videos be? The file size of a digital signal capture depends on the bitrate of the digital signal. The bitrate is set by the broadcaster and cannot be user configured. Bitrates for digital signals can range anywhere from about 1.2 Mbits/sec up to 19.3 Mbits/sec. Most of the time these bitrates are variable and not constant. Capture sizes for ATSC & QAM recordings are approximately 1.7 Gigabytes per hour up to 8.3 Gigabytes per hour. WinTV v7 does not open or opens and then disappears? “uninstall Wintv7” (or remove Wintv7 using control panel "add/remove programs) then you need to remove the backup channel database. Options) once you can get to this folder you will see a folder label “Hauppauge” delete this folder. Windows XP go to C:\documents and settings\all users\shared documents\application data ( this folder is a hidden folder so if you do not see it you need to “show hidden folders “ in your search Options) once you can get to this folder you will see a folder label “Hauppauge” delete this folder.